How is the contract situation at the PG? Not good. 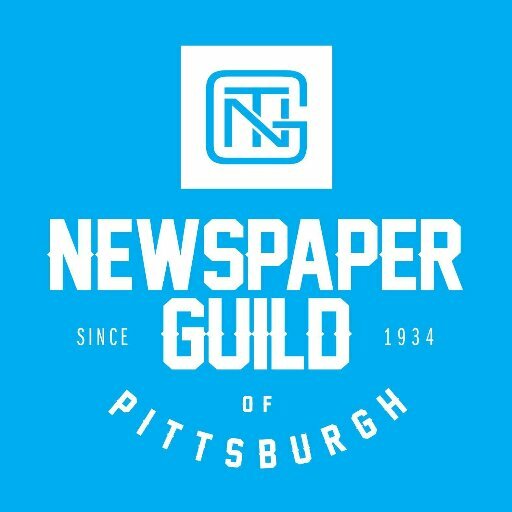 The Newspaper Guild of Pittsburgh’s contract expired March 31, 2017. Since then, we’ve been negotiating with the Pittsburgh Post-Gazette and its highly profitable Toledo-based parent company, BCI. As of December 2018, we’re in the 22nd month of negotiations. That sounds like a long time. It is! BCI and its owner, Post-Gazette Publisher John Robinson Block and his twin brother, BCI Chairman Allan Block, have sicced on the Guild the pricey, union-busting Nashville, Tenn. law firm King & Ballow. Their representative at the bargaining table is firm partner Richard Lowe. What does the Guild want? A fair and equitable contract. The dedicated journalists who put out the news around the clock every single day for the greater Pittsburgh community have not had a raise in 13 years. Meanwhile our members have given back millions of dollars in concessions — part of the tens of millions of dollars the Blocks have received from all of the PG’S unions — as part of years-long pay cuts to help keep the Post-Gazette afloat. Why is it taking so long to get a contract? The Blocks and Lowe gave us an absurd initial proposal that essentially sought to rewrite our entire 85-year labor history by eliminating all Guild protections and benefits and creating a new model management-rights contract. That means if it’s good for the Blocks, they want it. If it’s good for the Guild, they don’t. In one of the company’s most egregious and heartless proposals — since withdrawn — the Blocks and Lowe actually wanted to take away from Guild members a day of paid funeral leave for the death of a spouse. What should we know about King & Ballow? Why aren’t the Blocks and Lowe being more reasonable? We can only speculate that the Blocks wants to break our union and Lowe wants to make more money for his law firm. Is the Post-Gazette making money? Company officials regularly tell us how much money the PG is losing. That well may be true. But what is also true is that BCI, the Post-Gazette’s parent company, is highly profitable, became wealthy off the newspaper industry’s excellent profit margins in past years, subsidizes the PG’s operations, is privately held and has owners and top managers who are exceedingly wealthy and well-paid. What’s happening with the health care situation? The PG refused to pay a contractually mandated 5 percent health insurance premium increase in 2018. Even though our contract expired, specific language it contains as well as federal labor law obligate the company to maintain the contract’s status quo. The PG’s refusal triggered the Guild to file an Unfair Labor Practice charge with the National Labor Relations Board in Pittsburgh. The board ruled in our favor, and the company appealed. Then an administrative law judge also ruled in our favor and ordered the company to pay the premium. Again, the PG refused. They have a pending appeal before the National Labor Relations Board in Washington, DC. Share our FAQ on Facebook and Twitter and spread the word that the Newspaper Guild of Pittsburgh wants a fair and equitable contract! From left to right: Josh Croup, scholarship winner; Allison Schubert, guest; Tim Grant, PG staff writer; Janine Faust, guest; Ed Blazina, PG staff writer; Amanda Reed, scholarship winner; Nicole Pampena, scholarship winner; Daniel Moore, PG staff writer; Dan Gigler, PG staff writer; Alyssa Brown, PG copy editor/paginator; and Courtney Linder, PG staff writer. Since 1996, the Guild has awarded more than $64,000 to 46 college students who plan to pursue careers in journalism who either live in the Pittsburgh area or attend a college or university within the coverage area of the Pittsburgh Post-Gazette. The money can be used to pay tuition, purchase books and electronics or to help defray the expense of participating in an unpaid internship. From left to right: Scholarship winners Josh Croup, Nicole Pampena and Amanda Reed. In early April, Guild leadership and members of the scholarship committee attended a luncheon with the winners at The Foundry on the North Shore to celebrate. The funding for each scholarship is raised through “Off the Record” a satirical production of the Newspaper Guild, the Screen Actors Guild and the American Federation of Radio and Television Artists. In addition to supporting the scholarship, the primary beneficiary of this effort is the Greater Pittsburgh Community Food Bank. The winners are chosen by a volunteer committee of Guild members who score entries based on academic achievement, quality of journalism in the writing samples submitted, letters of recommendation and a personal essay. From left to right: Allison Schubert, guest; Josh Croup, scholarship recipient; Nicole Pampena, scholarship recipient; Amanda Reed, scholarship recipient; and Janine Faust, guest. Judges this year were Post-Gazette staff writers Courtney Linder, Daniel Moore and Tim Grant. The scholarship is named for Sally Kalson, a late colleague, friend and Guild leader who sadly passed away. A reporter for the Post-Gazette for more than 30 years, Sally was an award-winning Post-Gazette columnist and a longtime Guild officer and negotiator who wrote for the PG and worked for the Guild the way she lived life — with grace, humility, and a commitment to social and economic justice, civil rights, women’s rights, and human rights.